All kidding aside, I am also totally surprised by my new found enthusiasm for clean water. But am even more surprised by how little I knew about my municipal water yet the quantity I was consuming every single day! (Much less eagerly pouring to my family). I have read so many articles lately about how parents in today’s world feel an amazing amount of pressure to be p.e.r.f.e.c.t.. This doesn’t mean that my parents or grandparents weren’t concerned with raising healthy, emotionally stable, and intellectually sound individuals; it means that they weren’t obsessing over it ever second of the day while in constant (real-time) comparison with their peers (curse you Twitter and blog-o-sphere!). I’m taking a step back and telling myself that not every toy in my daughter’s room needs to be organically sourced, hand-made, rotated, purchased, polished, and seen on ever top learning site. I am re-training my brain that playing with a coffee can and milk tops is beneficial to my daughter’s development while also inspiring her creativity-didn’t have to cost money- and is acceptable. My Bible Study is currently reading Elizabeth George’s Putting On a Gentle and Quiet Spirit; and while this is an area that I am working on within myself (my mindset and heart), I also feel that it is a whole area of parenting that is often time overlooked. I feel this constant push and fight against time to cram everything that my daughter will need in order to save the world- before she even has breakfast (slight exaggeration, but you get the idea). And that is what is wrong with our generation; we have this constant fight and competitor’s spirit to push and prune our children into ultimate intelligent machines, never relaxing because that would make them idle. That would be so utterly, devastatingly bad. YIKES! letting my almost 2-year-old daughter guide quiet breaks during the day. After about 15-20 minutes of intentional activities, I am letting her feel the break and silence and decide for herself what activity is to follow. Then we ‘go with the flow’. Letting her decide how to fill her time will help her executive functioning and calm her spirit when there is a break; she doesn’t always need to be running this marathon of activities! Relax fellow Mommies. Meaningful moments of instruction far outweigh scattered activities just to fill the time. Unplug yourself from the outside world and it’s demands and today just sit with your kid and let them direct the play. Let yourself relax and enjoy the break from the rushing of our world. Let yourself be inspired by your child and discover the world around you together. Side note: in following this theme, I have taken somewhat of a hiatus lately from blogging and my Etsy shop. While I am LOTS of ideas and plans for the next few months, I am taking my time posting so that my priorities and time are delegated appropriately. While I am not listing an inventory right now for my Etsy storefront, I AM accepting custom orders and will respond to messages sent via Etsy. Obviously I have been a bit absent as of late… to all of you faithful readers (and bored web surfers) I will be back soon. Promise. updates. brownies. and partially mulched bushes. It is been a c.r.a.z.y. month! My Etsy shop got a slight face-lift thanks to a GREAT friend (make sure to stop by and see the new banner and uploaded images in the “About Me” section)! I created and gifted my first custom embroidered baby quilt!! I received custom orders for another baby quilt, embroidered bib and bodysuit, overnight bag and wet-bags from across the country!! You can follow me on Twitter, Polyvore and there’s even a fan page on Facebook!! I finished painting one of the last two rooms in my home that were yet to be touched since we moved in (3 years ago). My first raffle went splendidly; another big thanks to Talk for Me Tees. All of those things were going on while the baby bunny decided to take my dear hubby and I on a brutal journey through sleep regression land, (Two and a half weeks of three-hour stretches being awake during the night. It was NOT fun.) and we were tying up loose ends as we prep for a cedar fence install this week. Every time I went to the computer, there was something else that needed my immediate attention and about 5 posts have remained in the ‘draft’ stage. But, YEAY! I found a few minutes and wanted to update those that are loyal to my little blog and get out a good rant. After all; it’s a Monday. The Hubby and I decided a while ago that a fence would really improve our little one’s outdoor play- mainly by keeping her physically intact as cars use our small street as a cut through. After hosting about five different companies in my house for their full presentations- we decided on a single fence company. I am SO glad that I am done with sales people (for the time being); I thought listening to prospective furnace options was daunting: fencing is an even more complicated beast! After we picked our company, I thought that it would be a breeze waiting for our fence to arrive- after all- we didn’t need that much prep done to our open yard. The task was small; remove and grind a single side of our yard that had bushes acting as a privacy fence. The execution of said task was horribly annoying. We originally decided to have our neighbor help with the job since hauling away all the cut bushes seemed like it would be a daunting task. However, one day our other neighbor had a tree company out and were removing [a small forest of] trees. When they came by offering a quote for tree removal on our property, I entertained them out of curiosity. Their estimate was low. Really low. Lower even than if Hubby would rent a grinder himself to do the work. I thought this was a ‘no brainer’; as much as I wanted to give our hard-working neighbor the job, I could eliminate my Husband’s contribution and free up precious time on the weekend. The tree “company” sent workers over a few hours later and started to hack on our bushes. About 2 hours later most of the bushes were mulched and the workers were packing up. It took me two trips outside to ask the workers if they were going to finish removing the bottom portions of the bushes and large branches that were still in the area. The end result wasn’t encouraging. They insisted the rest would be done later as they took breaks about every 20 minutes from hauling small pieces of the bushes into the mulcher. I even had to run outside at one point as the owner of the company reversed down our block and around the corner, heading straight for my mom’s car! He got furious at me when I asked him to stop and go around the block in the correct directions. After all; fences are expensive- I didn’t want to add body work to the bill when I would need to fix up my mom’s car. I paid the company 75% of the bill with the understanding that the remainder of the bill would be paid upon completion of the job. Fast forward almost 2 weeks: the bushes were still above ground, with branches on them, debris all around, stumps intact- and my attempts to call the company resulted in their full inbox and me stranded with a fence install date just a few days away. Lesson of the rant: saving a few dollars isn’t always worth it. Hire workers that are efficient, have good recommendations, take your time seriously, and return phone calls. A company should return your phone calls in a timely fashion and or explain why there is a delay. We ended up finally having to track the owner down in person. He made us wait 40 minutes (we think in an attempt to have us leave out of frustration) before even talking to us and then gave us a list of excuses as to why he was so busy he couldn’t return our phone calls or have anyone out to finish the job. We ended up getting some of our money back and hiring our neighbor. (With a smile on my face) Bushes are currently being ground as we speak. And as a special thank you- the neighbor gets a plate of brownies with his cash. I appreciate follow through on jobs! Have you ever been ripped off by a contractor/ company? What did you do as a result? My plans are to contact the BBB this weekend. But that could all be delayed: fence will be installed Tuesday and I plan on spending the whole day outside staring at my improved yard (and watching the baby try to figure out how to escape). Need a rainy day project or a great overnight bag? Hop over to Coconut Robot’s blog today for a free tutorial!! It’s a ‘must try’. Coconut Robot’s modified cargo duffle. 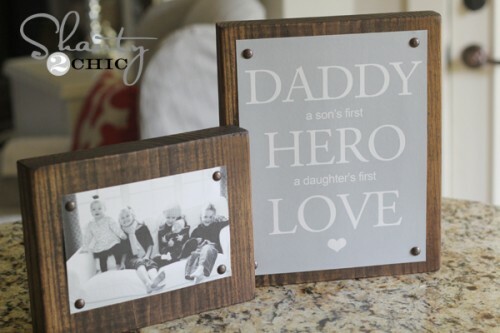 I am starting to think ahead to Father’s Day- not that I have this much time on my hands, but because I know I need to plan this far in advance if anything is going to be ready on time. 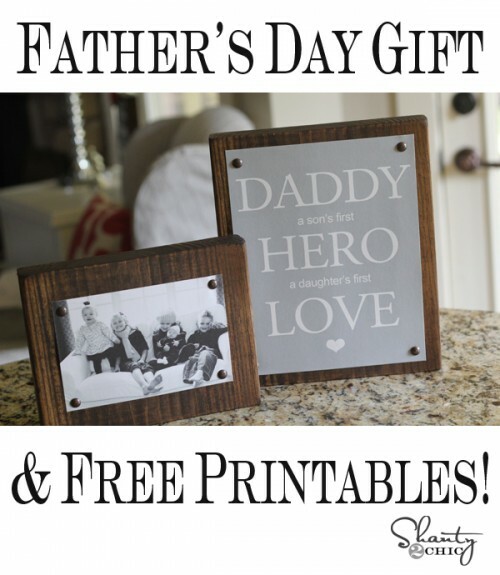 While the Hubby got his ‘dream machine’- a riding lawn mower- for an early Father’s Day, I still want to surprise him with something for the office. 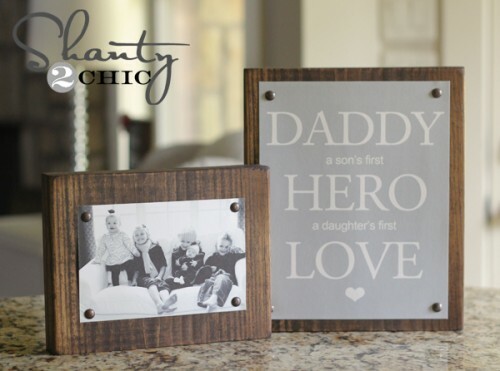 Enter- Shanty2Chic– and their fab. 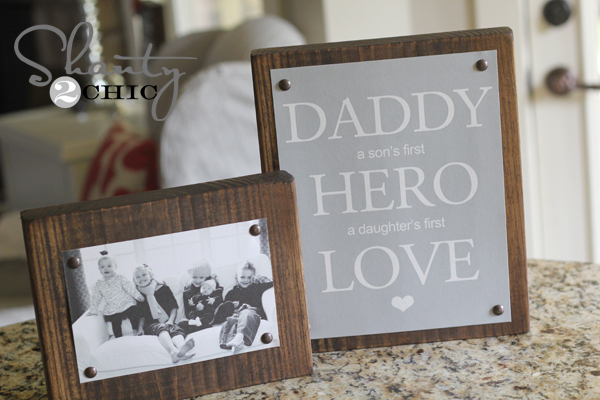 Father’s Day DIY frame! Love it. I made the printable in 3 different colors to give you guys options. These are so easy to print. You just click the printable you want to open the pdf file. Then, just push print from your top browser bar… Simple! Oh… And free ;-)! You will need one 2×10 board from Lowe’s or HD. I bought mine for $7.27. Cheap! I cut one piece at 11″ and another piece at 7″. You can also have the hardware store cut it for you! 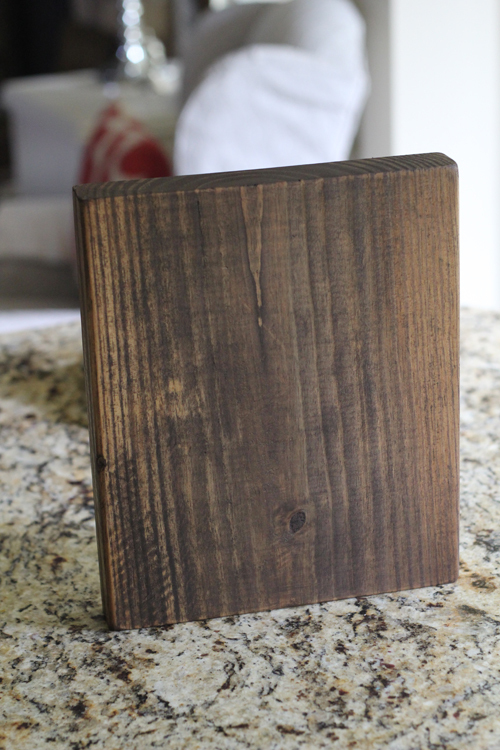 I used a new stain color on these! 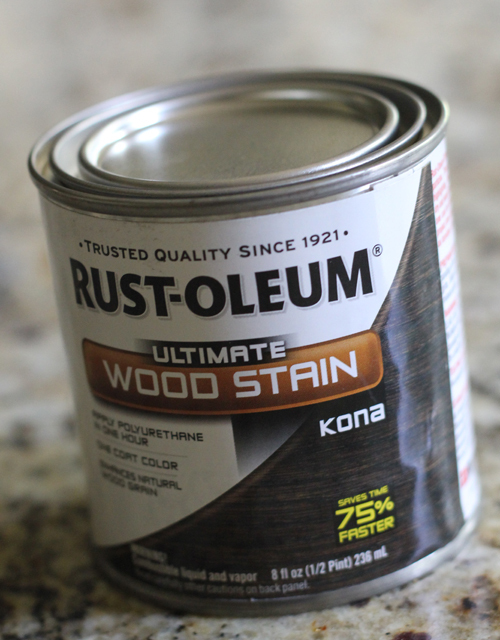 Just when I thought it couldn’t get any better than Rust-Oleum Dark Walnut, I found Kona! LOVE, LOVE! It only took one stain and dried super fast! 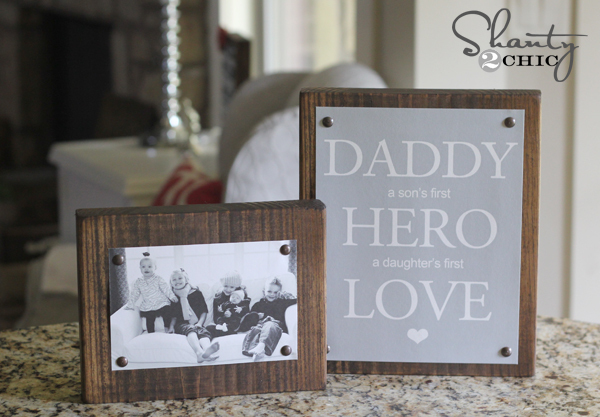 I decided to use the gray printable for my hubby. I printed it on regular white card stock. Then, I just trimmed the extra edge off. 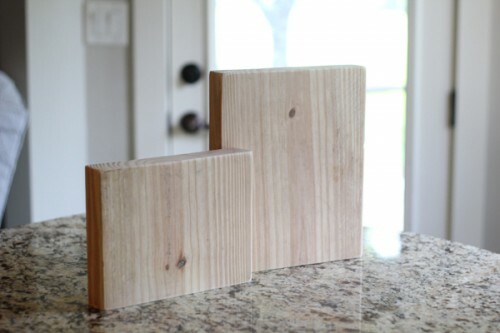 I attached my printable to my big block using these bronze furniture tacks that can also be found at the Lowe’s. 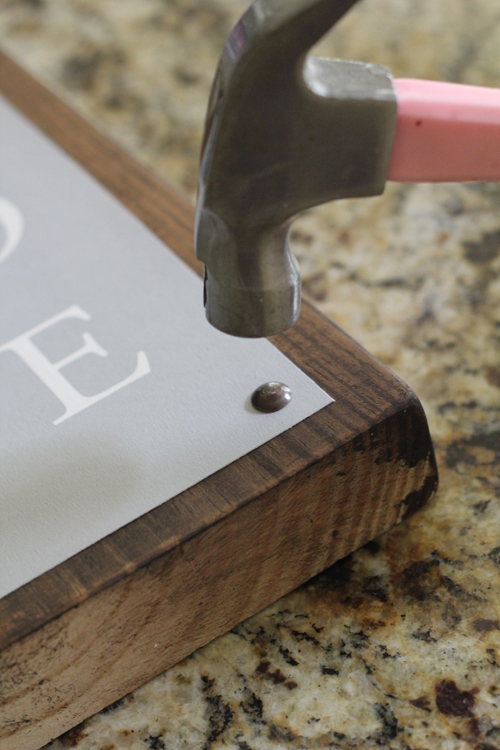 No need to glue or use Mod Podge… Just hammer it on! So easy!! I also printed a 5×7 picture of all the kiddos. You can do 1 hour developing at Walmart for under $2 if you prefer that! I used the tacks again to attach my picture to my other block. That’s it… Under 1 hour and under $10… Woohoo! 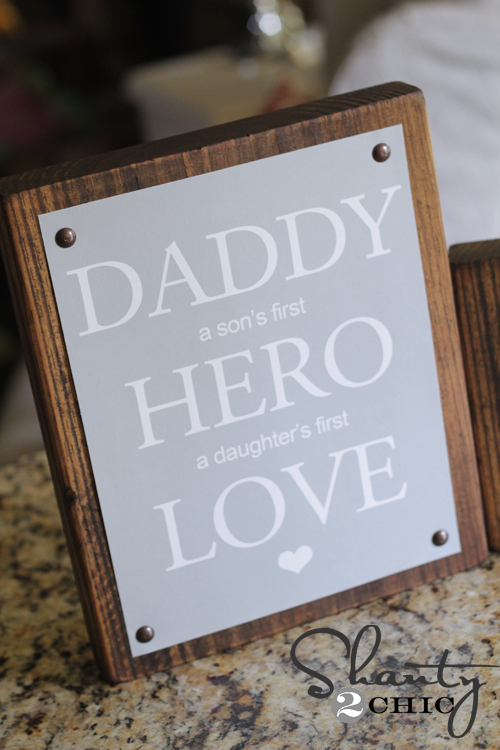 And I know my hubby will love it. That’s the best part! What do you think?? I would love for you to PIN and share this below!! Thanks so much for stopping by, and I hope you have a great weekend!! This tutorial is featured from Shanty2Chic blog’s post from June 8th, 2012 entitled: Father’s Day Gift & Free Printables. Find the full post HERE. All photos and information are cited from Shanty2Chic. I am going to make my own typography styled print for the second “frame” (since we only have a daugther)- who doesn’t love a little sunny day project?! Maureen just won a children’s allergy tshirt from Talk for Me Tee’s & RefurbishedTeacher. Stay tuned for more giveaways- and THANK YOU to everyone that followed, shared & entered!